In this enchanting city the past and present intersect in perfect harmony. Casually intermingled among ancient ruins and majestic cathedrals are the trappings of a modern metropolis: Skyscrapers,cafes, boutiques selling designer footwear. 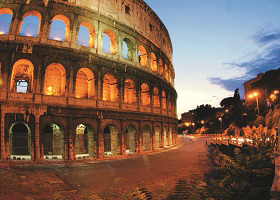 But of course what you seek first in the heart of Rome is its breathtaking history. A good place to begin is the Vatican, with its Sistine Chapel and St. Peter’s Basilica. Works by Bernini, Michelangelo, Caravaggio, and Raphael are just a few of those on display, any one of which is worth hours of contemplation. Then the ancient ruins—Colosseum, Forum, Circus Maximus. And of course the Trevi Fountain for the obligatory coins promising your return to the Eternal City. 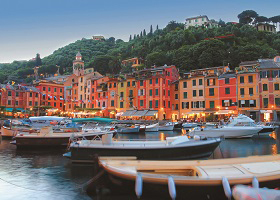 With its golden ochre and terracotta buildings, designer shops, and chic cafés, Portofino represents the height of Italian artistry and sophistication. Sip a cappuccino along the fabled marina or enjoy a day of shopping in one of the town’s tempting little boutiques. As you look out over the harbor from the famous Hotel Splendido, it’s hard not to admire the sleek, streamlined beauty of your Windstar ship. 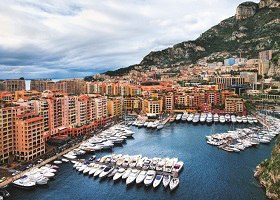 Spend a day wandering among the rich and famous in the chic epicenter of the French Riviera — a world of exclusive boutiques, palm-fringed boulevards, sun-drenched beaches, and elegant sidewalk cafés. Be sure to visit the Avenue of the Stars, where you can place your hands in the prints of international celebrities. An optional escorted walking tour guides you through the best of this extraordinary and stylish city. 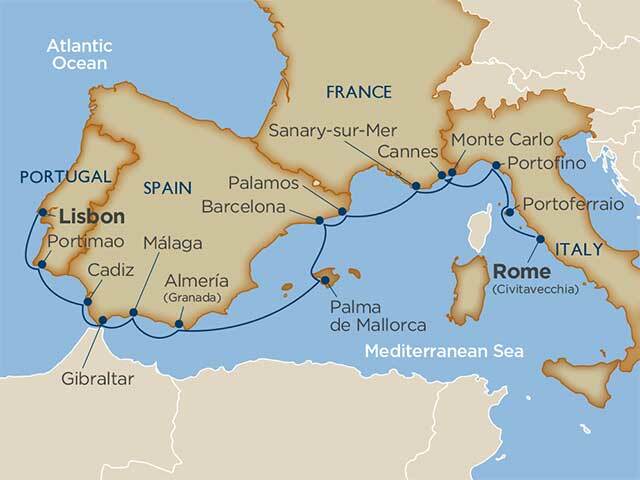 Glide into port in one of Europe’s most exclusive harbors. Mingle with other privileged yachtsmen or step ashore and start walking. The glittering Grand Casino, legendary for its exotic setting on screen and off, is a must see, as is the royal family’s palace and the tomb of Philadelphia-born Princess Grace in the Cathedral. 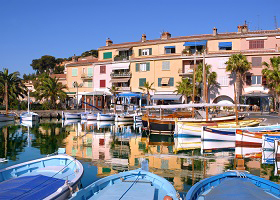 France’s sunniest city, located on the French Riviera, was originally a small fishing village and still is adorned by a large collection of traditional wooden fishing boats. This is the home of a group of local artisan fisherman who sell their catch daily on the pier and where Jacques Cousteau had a residence, the Villa Baobab. Palamos is famous for the locally caught prawns found in the beautiful bay it sits beside, also known for the excellent swimming, surfing, snorkeling and windsurfing there. Here is the place to try fresh local Catalan cuisine. 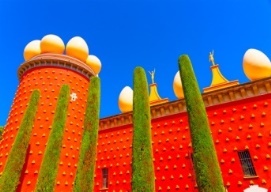 Two great highlights near Palamos are the Dali Museum, located in his home town of Figueres, and the UNESCO city of Girona, with its medieval architecture, walled Old Quarter and the Roman remains of Forca Vella Fortress. The old meets the new in this sunny Catalan metropolis, where narrow alleyways contrast with grand boulevards, trendy cuisine meets homemade tapas, and everywhere you’re greeted by the warm, welcoming smiles of the fashionable locals. 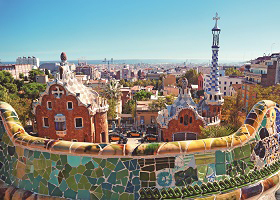 Don’t miss UNESCO sites like the mind-boggling architecture of Antoni Gaudí or La Sagrada Familia Cathedral, with its eight decorative spires soaring hundreds of feet into the sky. Mallorca is steep, green, and fringed with enticing coves and more than 200 lush beaches. But all that natural beauty is just the beginning. Stroll along the tree-shaded Paseo de Born in search of tapas. Shop for a Siurell; a traditional red, green, and white clay whistle dating back to the time of the Moors. 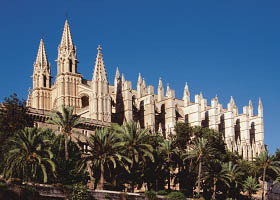 Watch the street performers on the piazza around the church, or cross the island to beautiful Sóller. Not to be missed is the cultural landscape of the Serra de Tramuntana, a UNESCO World Heritage Site. 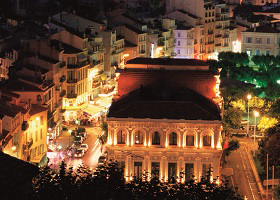 Enjoy a walking tour of this ancient city. If you prefer, opt for a beautiful drive through the Andalusian countryside to Granada and the magnificent UNESCO site, the Alhambra Palace. Built in the 14th century, this breathtaking example of Moorish architecture combines intricate mosaics and stone-cast latticework in a tapestry of grace and sophistication unparalleled in western civilization. 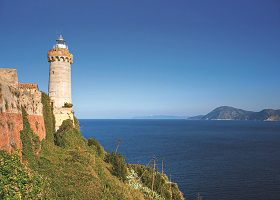 Or take an optional excursion into nature at one of three UNESCO Biosphere Reserves. 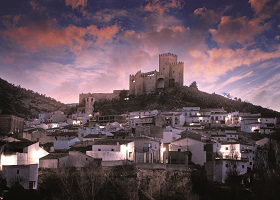 Here, on the shores of Costa del Sol, the Andalusian spirit thrives. Be sure to include an optional visit to see the brilliant and comprehensive collection of Picasso’s work at Museo Picasso Málaga, a tribute to this artistic genius in the city of his birth. 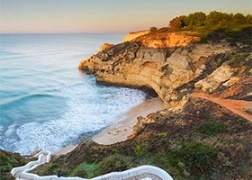 Or you may choose to opt for a visit to the beautiful village of Mijas, where picturesque Andalusian country life creates some of the world’s best wines. It’s an odd bit of Britain here at the toe of Spain, with Barbary apes and miles of tunnels as well as traditional red phone boxes. 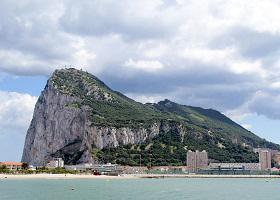 Legend says Gibraltar was one of the two pillars erected by Hercules to mark the edge of the world. Take the cable car to the top to see if you can see it from here. No, that’s not it. That’s just Africa. What a view. 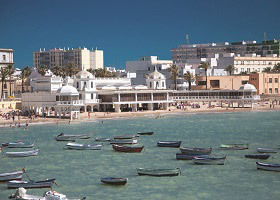 Cádiz is the most southern province of the Iberian Peninsula. It is extremely rich in natural beauty and some of the most important Natural Parks of Spain and Europe are found here including Sierra de Grazalema and los Alcornocales. Both are rich in flora and fauna, including species under threat of extinction. Many birds find their resting and feeding place here just after or before making the jump from or to Africa. Follow the savory aroma of sardines grilling to the colorful quay, or let your lust for leather lead you to the old town’s shops and 18th century buildings. In ancient Silves, once a Moorish capital, the castle and cathedral are right next to each other in town. How thoughtful of them to make sightseeing so easy. 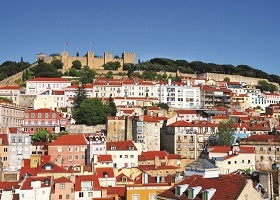 The rhythm of Lisbon invites you to join its captivating dance. This splendid capital city on the banks of the Rio Teja offers a warm welcome and an unparalleled blend of architectural styles. Elegant outdoor cafés line the cobbled sidewalks. Turn-of-the-century funiculars climb the scenic hills. Find the UNESCO sites of the Tower of Belem and the Monastery of the Hieronymites. And, everywhere, the city engages you with its easy style and remarkable charm.